Recently the newsletter of SAORI Canada-US Association has come out. I submitted the story of Lonnie Edelen who is my former student. He was an intelligent teenager who used to have day dreams often. I mean during a class he often started a conversation about something which made me surprise. The topics must have been about animals, doctor who, universe and so on. He kindly explained what he was talking about so I could catch up what he was thinking. He eventually started sharing his experience at school and at home. One of the sweet memories that I have with him is that his conversation with two classmates, Felix and Marcel. They would not have met each other in this world except a SAORI studio because they all have very different back grounds and living styles. However, they cared each other and got involved the conversation about sewing. Lonnie has made a bow tie which he wore at the graduation, I believe. So I was very happy that he agreed to write about his SAORI story for the newsletter. Here it is. 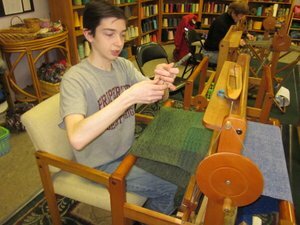 My name is Lonnie Edelen, and I am practitioner of SAORI weaving. My SAORI voyage started in Worcester at an art fair called “Start on the Street”. Walking with my family I saw a tent, and in this tent I saw an Asian woman (who I later learn is Japanese and is named, please let me spell this right, Mihoko Wakabayashi). In the front of the tent was a table piled high with woven goods. In the back of the tent were two looms that she was letting kids test out. I, being always curious, asked if I could try. She said yes. I sat down, and she showed me the basics. About forty-five minutes later my family realized this is one spot I was not likely to move from any time soon. I stayed there for the rest of the day. Sometimes a line would form behind me, and then Mihoko would politely ask me to get up and let other kids have a turn. I would get up and go stand in one of the back corners of the tent and wait. I waited for the line to cycle through and the tent to clear out. Then I would sit back down and start again. At the end of the day I went home and looking back found that I really enjoyed myself. 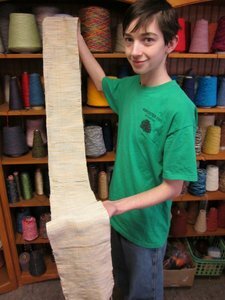 Mom: Yes this is Molly Edelen I was wondering if I could sign my son up for the beginners weaving course? Guy: Well, are you sure? You could bring him in one day to see if this is something he’d like to do. Mom: Well, he was with Mihoko all day at Start on the Street. Guy: Oh! Your Lonnie’s mom! Sure we can get him signed up. I began on my SAORI journey the next week, not realizing that it would last far longer than the six weeks of the beginners’ lessons. I was one of those people, who because of a lack of confidence felt this insistent, and illogical need to win or get things right, but when I sat down to weave the need went away and has not come back. I think the reason that I don’t feel a need to win in SAORI is because there is no way to win, the end result is not the objective. It is my belief that the real goal of SAORI lies in the process. I feel it is the nature of the SAORI style to create an atmosphere that encourages a free flowing state of mind. I have now gained enough self confidence to realize that the insistent, and illogical need to win or be right only diminishes my existence. I not only went back for the next course, but I insisted on a project that Mihoko warned me would take a really long time to complete and she was concerned that I might get bored before I had completed it. 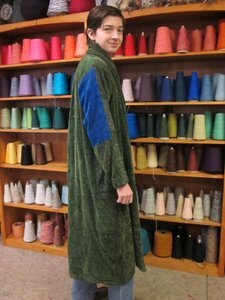 Well, I didn’t get bored and I made a full length coat that I still wear. What is great about weaving is that it is a meditative activity and after doing it for a while I am able to get in to a rhythm and it’s like I don’t even notice time going by on progress being made until I stop for a break. Another of the biggest reasons I won’t ever get bored with weaving is the seemingly endless possibilities, of course these possibilities can make it hard to decide what to do next. Then again, I am convinced that if I keep doing this for the rest of my life I’ll never stop learning new techniques. It is for this reason more then any other that I’ll never get tired of SAORI weaving. 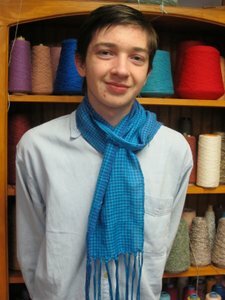 I’ve made many and varied items in my time using the SAORI style of weaving. Among the things I’ve made are: scarves, shawls, table runners, place mats, napkins, purses, card holders, mobius scarves, and wall hangings. Of all those I enjoy making the wall hangings the most. I’ve also used a great variety of yarns in my work including: cotton, linen, hemp, nettle, wool, mohair, chenille, bamboo, and silk. I do my best to avoid using synthetic fibers. Personally I think the natural ones feel much nicer to weave with, and they will eventually break down and nourish the soil which will then feed the plants and animals from which natural fibers come. Synthetic fibers, on the other hand will be filling our landfills forever. Four years after beginning my SAORI weaving journey, in my senior year in high school, I was thinking that I’d like to take a break from formal education. I also knew people were beginning to think of graduation gifts and I wanted to avoid getting a bunch of nicknacks, or worse THE PEN! Knowing that my family would soon be moving to rural WV where there would not be a studio to go to keep weaving, I asked if everybody could pool their resources and get me a SAORI loom so that I could keep weaving. I talked with Mihoko and my family about starting a weaving business and everyone was really supportive. I am currently living with my family on 7 acres in the backwoods of Hardy County, West Virginia. My weaving business, called Backwoods Weaving is just over one year old and growing. I am in a juried cooperative called Lost River Artisans Cooperative and I have items on consignment at both their outlet and the Lost River Trading Post, in Wardensville, WV. At the trading post I do demonstrations at least once a month. I have experimented with styles and ideas, yet I keep going back to the basics of SAORI, so I am working to become a registered SAORI weaving studio. I also have had many inquiries about teaching others to weave so I am applying to Akiko Jo for this privilege. I sometimes dream of having a van and setting up a traveling SAORI studio, a van with several looms and lots of yarns, so that I can share the joy of this type of weaving throughout rural WV. You can reach Lonnie Edelen at alonzoedelen@gmail.com. Thank you for your story. It unwound like a variegated spool of yarn. Your enchantment with SAORI weaving seemed predictable as the events began to unfold under the tent at Start on the Street. But then, like a variegated yarn, the twists and turns took you to places one might never have expected at the onset of your adventure. What a great story! Congratulations to Lonnie; Saori has really impacted his life and he is passing on the gift. I have received many wonderful responses to Lonnie’s story. He is and will continue to be a wonderful SAORI ambassador. What a wonderful explication of your SAORI journey.